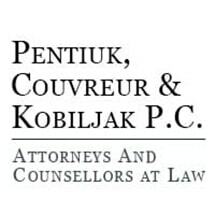 Pentiuk, Couvreur & Kobiljak P.C., comprised of experienced Michigan lawyers dedicated to excellence, is a law firm that represents clients throughout the State of Michigan. In the profiles of our attorneys, you will discover why Pentiuk, Couvreur & Kobiljak, P.C. is highly regarded as the premier law firm in the Downriver Detroit Community, and is widely respected throughout Metropolitan Detroit, Wayne County and the State of Michigan as a firm as zealous and experienced attorneys committed to serving our clients with the finest legal representation. Each attorney is licensed to practice law in all of the courts within the State of Michigan, ranging from the trial court level of district and circuit courts, through the Michigan Court of Appeals and the Michigan Supreme Court. We routinely appear at the trial courts in Wayne, Oakland, Macomb and Monroe Counties and others. Our attorneys are also admitted to practice in various federal courts, such as the United States Supreme Court, the Sixth Circuit Court of Appeals, the District Courts for the Eastern and Western Districts of Michigan, and the Bankruptcy Court.